What comes to your mind when we say the word 'fort'? It is a construction or building used for safeguarding territories by military forces during a war. If you want to catch a glimpse of the mesmerizing Portuguese constructions in Goa, the forts are definitely worth visiting. Tourists from all around the world love being here and exploring the colourful history of the beach state. Goan forts might presently be in ruins but are nonetheless fascinating. 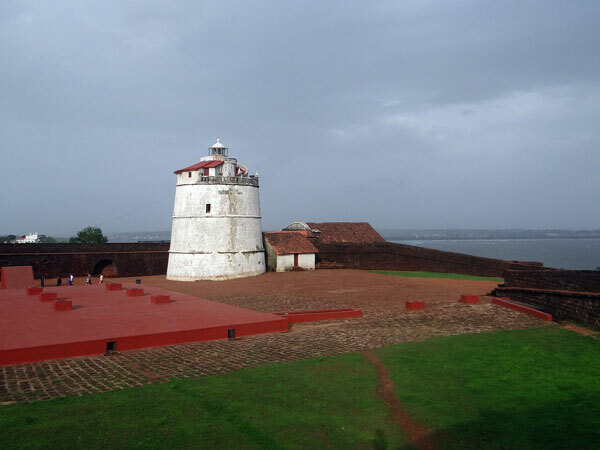 Let us venture together and talk about the ten famous forts in Goa. The alternative name for Chapora Fort was the 'town of Shah' which is situated at a distance of about 10 km from Mapusa in North Goa. The fort prominently overlooks the dazzling Vagator Beach, Morjim Beach, Ozran Beach and the mouth of the Chapora river. The Portuguese built this fort with the purpose of strictly keeping a check over the Hindu raiders in the 17th century. The fort was attacked twice by Sambaji, the son of Shivaji in 1683 A.D and then by Bhonsle in 1739 A.D. Until the independence of Goa, it was ruled by the Portuguese from 1741 A.D. Their reign saw the emergence of underground tunnels which could serve as a probable means of absconding the area. Arrow slits, gun ports and murder holes can be spotted on the walls of the forts at equal intervals. The most amazing fact about the fort is that the shooting of one of our favorite Bollywood films 'Dil Chahta Hai' also took place here! You can traverse to this fort by road from Mapusa. It is located just 2 km before the Vagator Beach, towards the right. A hill present in the Vagator Beach shall also help you reach the Chapora Fort with complete ease. The Corjuem island fortification was built for the protection of the Portuguese in the 19th century. It is not very far from the village of Aldona, around 6 km and is located in the Bardez taluka of North Goa. It gets its name from 'khorik' which is defined as 'deep' or 'lower' and 'zunvem' which means 'island'. It is a square-shaped fort which was erected in the year 1551. The corners of the fort are fashioned by ramparts which can be reached by a ramp-like stair present in each corner of the fort. Watching the Goan landscapes from here is a definite treat to the eyes. The fort sports three rooms and a well along with a small chapel. The Corjuem Fort has also been said to house the famous chapel of St. Anthony in the past. The fort is proud of the fact that out of the two sustaining inlands, it is one of them. The fort is pretty charming and is adorned by carpets of lush greenery. The fort is fabulously constructed of pitted laterite stones. Reaching the fort is no major task. It shall be a smooth sail from Aldona to Corjuem via a cable suspension bridge which does attract a lot of attention as it is the prime suspension bridge in Goa. Always wondered which is the most well-preserved fort of Goa? Say hello to the citadel constructed by Afonso de Noronha, a Portuguese Viceroy. This fort was built between 1551 and 1554. Where is it located? Right on the hill onlooking the magnificent Reis Magos Church, at the merging point of the Mandovi river. The Archaeological Survey of India helped revive the fort as a heritage centre of Goa. The views from all sides of the fort are phenomenal and extremely photogenic in nature. You could click endless photos to fill your Goa holiday album. Present at the mouth of river Mandovi, this fortification offers a gorgeous sight of the Arabian Sea. The idea behind building the fort at this particular location was for the prevention of attacks by enemies. This beautiful fortress constructed in 1612, also boasts of a four-storeyed Portuguese lighthouse which is delightful to visit. Since the waves love crashing against its walls, it is the one-stop destination for numerous passing ships. The 17th century saw the erection of this fort by Maharaja Sawant Bhonsle, the Raja of Sawantwadi. Its location is on the Terekhol river. It was rebuilt in 1764 as it had been seized by Dom Pedro Miguel de Almeida, a Portuguese Viceroy. The fort courtyard which houses the beautiful church of St.Anthony is a gorgeous place to spend time with your near and dear ones. It shall amaze you to know that it has been converted into a heritage hotel, Fort Tiracol Heritage Hotel, which is accessible by the general public only on special occasions. Built in the year 1612, the Sinquerim Fort is located in Candolim, North Goa which is at a distance of 18 km from Panaji. It shall surprise you to know that the Sinquerim Fort is an augmentation of the Aguada Fort on the lower side. Also, thanks to this fort that the Sinquerim Beach shoreline separated into two. Engaging in water sports at the beach can add joyful moments to your Goa journey to cherish forever. It is also a stopover for crossing ships to stock on food and ammunition. Did you know that our beloved Rama and Sita stayed at this fort during their 14-year banishment from Ayodhya? This fortress in Canacona taluka shelters the church most worshipped by devotees, the Church of Santo Antonio. The mesmerizing sight of the Cabo de Rama beach shall leave you speechless. The beach is famous for its serene atmosphere which shall wash away all your worries. Lying in the northeast of Margao, it is Famously known for its waging wars between the Vijaynagar and Bijapur empires. It was handed over to the Portuguese in 1520, in return for military support against the Muslims and is highly praised for its scenic brilliance. As of now, there is only a gateway existing there which leads to the Rachol seminary. The port of Vasco is guarded by this citadel which is situated in the northwestern point of Salcette. Although the ruins of the fort now only speak of the presence of a chapel and fort wall, it initially comprised of a chapel, five prisons and gigantic bulwarks. Mormugao was a significant port for the Portuguese ships. This was built by Dom Francisco da Gama for safeguarding the South Goa bar. It definitely deserves being visited! This is a naval fort present on the Anjadip island, at the tip of Goa. It was built by the King of Portugal as advised by Vasco Da Gama and Gaspar Da Gama. As a marine base marks its presence on the Anjadip island, the fort is not accessible to the public. You shall be taken aback to know that the fort was captured by the Indian Forces during the Goa Freedom Movement on 18 December 1961. The capturing of the fort was referred to as 'Operation Vijay'. The forts of Goa definitely have a lot to say and the tourists shall enjoy a pleasing time filled with moments of leisure and vibrancy.